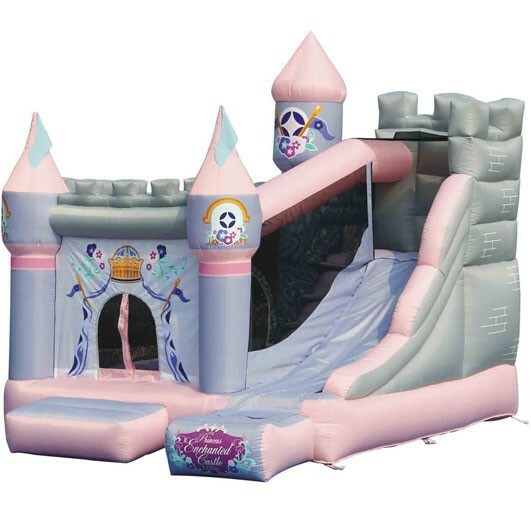 The Princess Enchanted Castle bounce house and slide is perfect for any Princess adventure. This bounce house has classic princess graphics and a front curtain opening which makes it feel like her very own castle. The Castle slide is accessed from the inside of the bounce area and is approximately 5 ft tall. There is plenty of room inside of the bouncer for up to 4 kids and holds up to 400lbs total weight. Weight of inflatable: 98 lbs.